Hello, everyone! 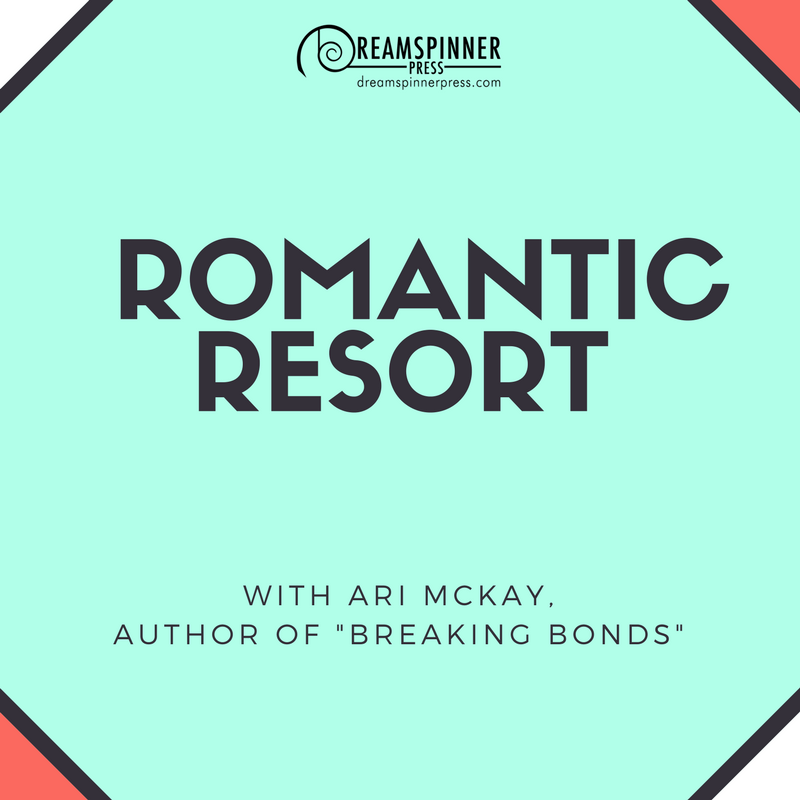 Ari here, and I’m so very glad you decided to drop by to spend a few minutes with me on the release day for our new Dreamspun Desire story, Breaking Bonds! This is the second book we’ve written featuring one of the Walker boys, from our big family of Texans who love food, family, and romance, and we hope you’ll enjoy reading it as much as we enjoyed writing it! 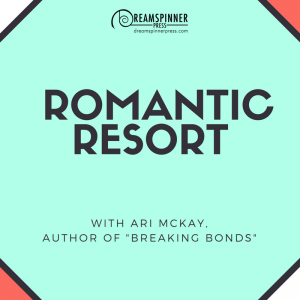 I probably tend to get carried away with my excitement over the stories McKay and I write, but like many authors, we put so much of ourselves into our stories that we can’t help but become attached to them. I found myself more than a little attached to Liam Walker, our MC who takes a break from the cut throat competition of the New York culinary scene to try to get back his sense of perspective. The place he chooses to do that is a fictional resort called The Overlook which happens to be set in a very real place – Maggie Valley, North Carolina. I’m not a professional chef, although I do love to cook and have a fond wish to someday own a bakery. But one thing I brought to this story was my experience with the food service industry. I spent several years while I was in school working at a country club in Miami, where my cousin was the maitre d’. We catered parties of up to seven hundred people in the big ballroom, and so I became intimately familiar with how big commercial establishments are run. The executive chef of the place was a large, loud, demanding man whom we all called Chef Ray. He was a perfectionist in all things, and while the catering staff were mostly teenagers like myself, we learned quickly to adhere to his standards or risk a tongue lashing that could reduce anyone – the boys included – to tears. There’s a little of Chef Ray in Liam, I have to admit, and while I’m sure Chef Ray has passed on by now, I hope he wouldn’t mind. Liam was interesting to write because he has so much drive and determination, and knows exactly where he’s going and how he’s going to get there. Or he does until he meets a certain dark haired, dark eyed resort owner who needs help, and that throws a bit of a curve into all his carefully laid plans. But love has a tendency to do that, doesn’t it? That’s the core of Liam’s conflict, because he learns that the issues he had thought were so overwhelming in New York suddenly mean nothing in the face of finding someone he really desires and connects with, someone he comes to realize that he wants more than he wanted his career. And yet he isn’t free to just walk away, either. I’m sure a lot of us have been caught in a similar situation, torn between desire and obligation, between love and duty. It’s a hard place to be in, as Liam discovers, and no matter what choice you make, you feel like it could be the wrong one. Fortunately for Liam, his personal happily-ever-after was assured, but it doesn’t always work out like that in real life, alas. But that’s one of the wonderful things about fiction — you can use your own experiences, and yet make sure the outcomes are everything you want them to be. So now I want you to share with me! Tell me what real life experience you have that you think would make an interesting story? Who knows, maybe our next story we’ll be asking for your input! 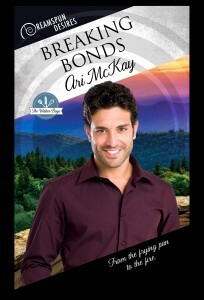 Check out Breaking Bonds today! Arionrhod is a systems engineer by day who is eagerly looking forward to (hopefully) becoming a full-time writer in the not-too-distant future. Now that she is an empty-nester, she has turned her attentions to finding the perfect piece of land to build a fortress in preparation for the zombie apocalypse, and baking (and eating) far too many cakes. Congrats on your new book release! It looks great. I don’t think I have any stand out skills. I cook alright, I crochet okay, my organization skills are passable and musical abilities are intermediary.